Temperatures have dropped and winter is upon us! If your family loves the snow as much as mine does, winter often includes a family ski vacation. However, as every parent knows, traveling with kids can be challenging, especially when it involves a trip to the mountains. It’s not uncommon to run into a few hiccups between the travel time, equipment and getting the family ready to hit the slopes. 1. Location, Location, Location – Consider the proximity to the slopes before booking lodging. Ski-in, ski- out is ideal, especially with young kids. If ski-in, ski-out is not in your budget, consider valet parking or using the resort unloading zone to drop the kids off with one parent. Anything to lessen the amount of time spent on walking to and from lifts in boots carrying heavy equipment. This can tire young ones out even before they hit the slopes! A few of our favorite family ski vacation destinations include Whistler, Aspen, and Snowbird. These and other family-friendly ski destinations can be booked at better-than-web pricing through TheTravelerSite.com. The Travel Site offers rewards on global travel with 50% of The Traveler Site’s commission going back to support Protect Our Winters. Ceate your free account today using code: BLUEANGELSNOW. 2. Yelp It! Do your homework on the resort and its ski school/child care options. Check reviews, make sure it is conveniently located near your lodging. Verify ages and types of programs they offer for each age and ability range. Unhappy campers won’t want to give it another try. 3. 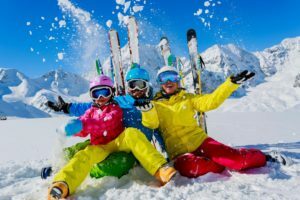 Gear Up – Ski and snowboard equipment and clothing that fits well and is in good condition is essential to having a positive on-snow experience. Boots that fit right are warmer and more comfortable. Ski and snowboard technology has improved making it easier to master the slopes. 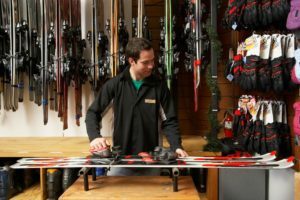 Shops also offer equipment leasing options giving you access to the latest equipment each season without breaking the bank! Visit our Equipment Section for a complete list of retailers offering sales, leasing and rentals. For a list of ski/snowboard clothing recommendations click here. 4. Lids on Kids – The National Ski Areas Association supports the use of snow sport helmets and we do too! With the encouragement of resorts and parents as well as helmet education, snow sport helmet use has increased year after year. Properly fitted, fastened helmet’s can reduce injury by as much as 30% to 50% and may be the difference between a minor and a major injury. Visit www.lidsonkids.org for more information, safety tips and research to help better understand the benefits of helmet use and snow sport safety. 5. Practice Makes Perfect – Get your kids involved at a young age if you are fortunate enough to have a ski or snowboard camp in your area. Well prepared kids are more comfortable hitting the slopes. This sets the tone for a much more relaxed and stress-free family ski vacation for everyone. The Blue Angels Program offers instruction to skiers and snowboarders ages 7 to 16 in California. The program includes professional ski lessons, bus transportation, lift tickets, lunch and adult supervision. For more info, visit Northern California Camp or Southern California Camp. 6. Relax, Chill Out – This may not be like the trip you took in college with your buddies when you charged all day. Go in with the mindset that this is a trip for the kids. You are planting the seed to grow upon for future years. Your first family ski vacation with young ones should be about the fun of the entire mountain experience. Plan your day around plenty of hot chocolate breaks, leisurely lunches and plenty of kid friendly après ski action. Don’t be disappointed with a little more (or even less) than a half day on the slopes. Keep it fun, comfortable and light hearted and they will want to come back year after year!